If you have any questions or want to enquire about dates, use our form to contact Daniela Venturi or see their website for more information. Turn off a country road, through a farm, deep into woodland and, just as you give up hope, the trees clear to reveal a sturdy farmhouse, all soft grey stone and sage-green shutters. No sounds other than birdsong, no buildings other than a distant farmhouse; just forested hills and Paolo’s magnificent rose garden. He and Daniela – plus Gina, their retriever – welcome you as friends. Paolo takes you round his gardens; Daniela shares family recipes in the cosy kitchen during her cookery courses. Rooms are light-filled and rustic – tiles, beams, antiques – warmed with boldly painted door-frames and colourful ceramics. Pretty bedcovers, sloping ceilings and tranquil views add charm to (small-ish) bedrooms; bathrooms make elegant use of tight spaces. Relax in the comfy lounge or outside in the courtyard with its green views and pergola-shaded table. Be tardy over shared breakfasts – homemade bread and cakes – while planning walks, or trips to Siena and Chianti vineyards. Paolo worked in tourism so is knowledgeable. Return for a swim before enjoying one of Daniela’s dinners or sizzle up a barbecue. Intoxicating peace. Minimum stay: 2 nights at weekends & in high season. Restaurants 2km. Dinner available on request. Singles €75-€90. Extra bed/sofabed available €20-€30 per person per night. We spent four days in Daniela and Paolo’s lovely farmhouse. They are exceptional hosts and made us feel like old friends. Daniela is a great cook and we ate her delicious and very filling local Tuscan meals every evening. Paolo was very helpful with his local knowledge and gave us tips on where to park in Florence and Siena and the best vineyards to visit. The farmhouse lies in a beautifully tranquil valley, accessed by a gravel track down a hill and through a wood ( where we saw wild boar). Our room was very comfortable and clean and the guest lounge has a cosy log fire in winter. Lovely! Daniela & Paolo made us so welcome it felt like visiting old friends. They love to share their home, knowledge of the area, cooking skills and rose expertise. The house and grounds are quiet and beautiful and the swimming pool looked very attractive but unfortunately the weather was too cool for us to take the plunge. For breakfast, alongside everything else you might expect, there was a different home-made cake every day. Daniela cooked dinner for us on three nights - it was excellent. If you want somewhere quiet, comfortable and don't mind being off the beaten track you will love it here. Our hosts welcomed us into their Tuscan paradise with open arms and made the whole stay truly magical. This place is the best of the best - incredible peace, beautiful roses, delicious food and fabulous company. Ask for insider knowledge of the local area and you won't be disappointed. We wish we didn't have to leave and will be back. We had a wonderful time at Podere Il Colto, a special peaceful place. Paolo and Daniela are very hospitable hosts. The room and good bathroom were comfortable. Daniela is a great cook offering dinner in the evening and cookery lessons where you eat what you cook. They will recommend restaurants and draw maps to enable you to find your way to where you want to visit. The beautiful garden full of flowers with an infinity swimming pool has sufficient sun loungers for all the guests. We hope to return. A slice of heaven. This place is the embodiment of everything I love & value, the setting, the peace, the beautifully restored farm house. Daniela & Paolo are the best kind of people, warm, generous, kind, caring, such gracious hosts, they cldn't do enough for us & we thoroughly enjoyed their company. Gina is such a sweet dog too! HIGHLY recommend Daniela's cooking class it was such fun & the delicious meal at the end so rewarding. Daniela's cooking & baking is to die for, she's very talented, best food we had in tuscany, her breakfasts & dinners were a real treat! Didn't want to leave! We enjoyed our stay at Podere il Colto so much that we changed our travel itinerary so that we could return at the end of our holiday - need I say more? 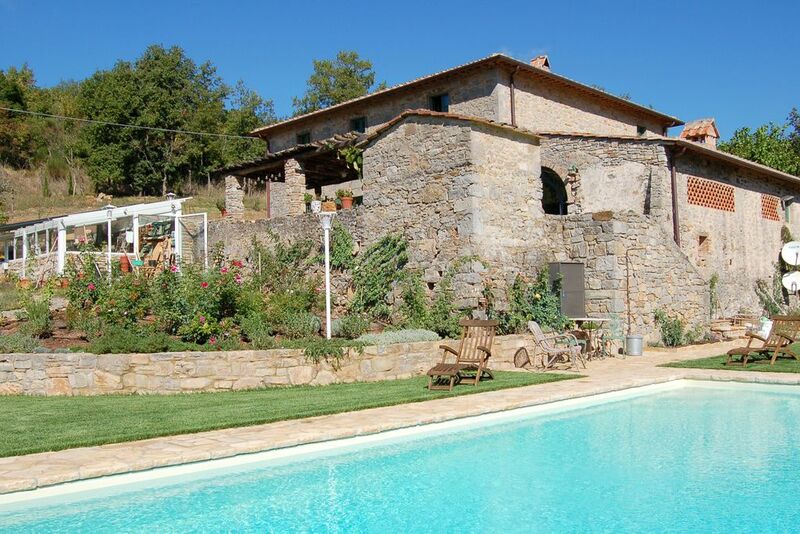 You really feel as though you have your own slice of Tuscan paradise here. Immaculate and tastefully decorated rooms, beautiful gardens with pool and complete peace. Above and beyond all of this, Daniela and Paulo are warm and welcoming hosts and we felt truly at home as soon as the gates opened. Daniela is a fantastic cook, we enjoyed three of her four course meals made with fresh produce from the garden and breakfasts are delicious too! Paolo and Daniela were very friendly and helpful, even guiding us into Siena to a convenient car park. We had a different homebaked cake every morning at breakfast and Daniela cooked us two 4-course evening meals of Tuscan delicacies, accompanied by various drinks, which were fantastic. The woodland setting, garden and infinity pool were wonderful to come back to after a hard day sightseeing. Beautiful quiet haven in Tuscany. Daniela and Paulo are wonderful hosts and nothing is too much trouble. The house is beautiful and clean and the location is so quiet with beautiful views. The pool was a godsend during a very warm visit. Breakfast to die for too. All in all, a perfect stay. Upon request Daniela organizes cooking classes, teaching family recipes and Tuscan dishes and revealing the odd secret! A half-hour drive away is the historic city of Siena. Its Cathedral houses works by Michelangelo, Donatello & Bernini. Visit the Torre del Mangia in the famous Piazza del Campo or the medieval towers of San Gimignano and Monteriggioni. In just over an hour you can visit Cortona, which contains extraordinary buildings, rich in history and religion, such as the Hermitage of San Francesco and the Sanctuary of St. Margaret of Cortona. In little more than an hour you can visit the amazing city of Florence - heart of the Italian Renaissance.